In many respects, experience is the best teacher. For the bush pilot, experience teaches that when the job requires a risky landing on some rough gravel bar, short mountain ridge, tiny pot-hole lake, or postage-stamp sized chunk of pack ice, the Super Cub is in a class by itself. It is hard to say exactly what it is about this airplane that makes it better than its competitors, but a lot of it seems to be in the combination of stalling characteristics, control balance, and the way its stiff, sturdy landing gear, equipped with low-pressure tundra tires, handles difficult terrain. Most bush pilots appreciate its agility, not only during approach but on the ground as well. For some reason, the flow of forces seems just right for this type of work. Its construction is also uncannily suited for work in remote areas. With its simple steel frame covered with Ceconite fabric (easily patched when necessary) and dependable 2,000 hour TBO Lycoming engine, the Super Cub can be operated for extended periods far from maintenance centers and parts houses. However, for those who fly the remote bush professionally and operate out of the most marginal of strips -- often hardly more than 200 measured feet or so of rough, one-way gravel bar -- the stock Super Cub, as good as it is, is not completely satisfactory. It requires certain modifications to achieve its full potential. Let's explore the modifications professional bush pilots require for Cubs operated on wheels and skis in Alaska and Canada. Prop. The stock prop works fine for photography, pipeline patrol, and running around the "spread" down in Texas, but for the bush pilot it is too short and has too coarse a pitch for optimum takeoff and climb. Prior to 1967, the bush pilot's only option was to have the stock prop repitched at the local prop shop. Then Rodger M. Borer designed and obtained an STC for a long McCauley prop. The Borer prop, especially in 42 pitch, makes a decided difference in takeoff and climb, and few Super Cubs in Alaska or Canada today are without one. I recommend it most highly. Safety-cables. The rough fields which we use in our daily work place great demands on our landing gear. While much can be done to alleviate this problem with proper tire selection and inflation (see below), and flying technique (see Section II), there is little that can be done about rough, rutted ski strips, especially those in small villages and next to lodges that get used a lot yet receive no winter maintenance. Recognizing that the main problem was either the upper inside attachment points (ears), which tend to break at the fuselage, or a failure of the shock assembly, F. Atlee Dodge (the grand master of Super Cub mods) came out with a set of safety-cables that provide a backup (see illustration 14). Truly good insurance, especially on skiplanes, they have been credited with saving many a prop and wingtip from serious damage, and it is rare to find a bush-equipped Cub without them. The best way to install these cables is to mount them so the lower cables ride on top of -- rather than hang below -- the shocks (see illustration 23). This helps to prevent your landing gear from taking on the appearance of a florist's display after a visit to some nice field covered with fireweed during the fall hunting season. Axles. The landing gear of the Super Cub has hollow axles, another weak point when the airplane is operated on rough terrain (especially on skis). The standard treatment is to have your mechanic insert short pieces of galvanized steel water-pipe into the axles for reinforcement; once this is done, the problem is taken care of and can be forgotten. Tires. There are two good reasons for putting large tires on airplanes that must be operated on soft, rough strips, only one of which is well understood. Footprint. If the field is soft, it is obvious that a larger tire will increase flotation, and this in turn will decrease the risk of damage to the airplane when landing. Depending on where and how you must operate, sizes from 8:50x6 up to the 30-inch tundra tire will prove satisfactory. Cushioning. When you land on a rocky gravel bar, or have to go across small gullies, you need something to relieve the shock, and low-pressure tires will do this. The tires roll over the rock (or whatever) the way a pillow might, enfolding it gently. Yet, oddly enough, many Super Cub pilots do not seem to understand this, for most of them carry far too much air in their tires. For years I have used approximately six pounds of air in my tires, and while they always appear half flat (note where the dirt-line is on the tires in illustrations 6 and 23), they permit very soft and gentle landings and takeoffs from truly rough terrain. The old 24x10x4 and the currently available 26x10.5x6 tire sizes are the ones most bush pilots in Alaska prefer. They seem to provide the best balance between footprint and shock-absorption for general use of any of the tires currently available. As for the 30-inch low-pressure tundra tires, except for a few special jobs, e.g., when operating from mud flats or certain tundra areas, their size works against them. They require noticeably longer ground-runs, in comparison with the 25-inch tires, due to (1) very poor braking on landing, and (2) added friction and drag during takeoff. This, combined with the added weight, makes them a poor choice unless absolutely necessary. The 8:50x6 tires (whose main benefit is cost) are passable on terrain that is not too rough or soft, but should be avoided whenever possible (see illustrations 5 and 28). Windshield defroster. F. Atlee Dodge makes a kit for this, necessary during winter if you want to see outside the window. Metal headlining and extended baggage compartment. Another of Atlee's modification kits, this markedly increases the cargo space in the Super Cub. Tailspring. The stock factory springs will not hold up under the job, and must be replaced with heavy-duty springs. For many years I had them made up by a local spring shop in Anchorage, but now Piper offers a set for their ag-model that does the trick. The Piper parts numbers for this set are #64079-02, #64079-03, and #64079-04; one of each is required, and a small bottom-plate will have to be made, of hard steel, to hold them at the rear attach-point, using long bolts down each side of the springs. "STOL" mods. One of the Super Cub's strongest points is the exquisite harmony of its control interrelations combined with the way its stall progresses. 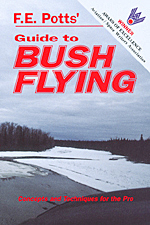 This allows the experienced bush pilot who has a good feel for his airplane's slow-flight characteristics to make the final part of his approach into a short strip with the wing right on the edge of the stall (see Chapter 17). However, when you alter the Cub's wing from factory specifications by drooping the ailerons or wing-tips, or the leading edge -- all common STOL mods -- so as to slightly increase the angle-of-attack the wing can achieve, thereby slightly lowering your airspeed, you end up paying a price. In this case it is the airplane's superior stalling characteristics; they become tricky, abrupt, and unpredictable in even mildly turbulent air. Therefore, except in conditions of dense, calm air, the wise pilot hesitates to slow the STOL-Cub as much as he might a stock one, which no doubt accounts for the fact that I -- along with most other high-time Cub pilots -- have yet to meet a pilot who can operate one of the wing-modified Cubs out of strips any shorter than those we use with our standard Cubs. In fact, the reverse is usually the case. You can't really buy short-field capabilities, no matter what the ads say: you have to earn them through laboriously acquired skills. Note that the Super Cub, like the Cessna 180/185, is equipped with mechanical flaps operated with a Johnson Bar. This feature is of special interest to the pro working the shortest strips, and its use will be covered in Section II.